Ollantaytambo (called by locals Ollanta) is a town in the Sacred Valley of the Incas near Cuzco in the Southern Sierra region of Peru. This is where the Incas retreated after the Spanish took Cuzco. Much of the town is laid out in the same way as it was in Inca times. There are combis that travel frequently between the market in Ollantaytambo and the bus station in Urubamba. They are crowded, but at S/2 one way (as of Jan. 2019), it is by far the cheapest way to travel. There are also comfortable mini-vans which run between Cusco and Ollanta (via Urubamba) for S/10 (as of Jan. 2019) for the 2h trip. They run all day, leaving when full, which might take hours on not a busy part of a day. In Cusco, catch the vans on Calle Pavitos, which is between Belen and Av Grau, 3 blocks west of Av El Sol. Ignore travel agencies that try to charge you US$10 for this service (with hotel pick up). The price is S/.15 and Calle Pavito is within easy walking distance of Plaza de Armas. You can also get shared private cars for S/.20 per person. Quicker (1h15-1h30), but less comfortable and not as safe; some of the drivers drive excessively fast. From Pisac : you will have to make a connection in Urubamba. Pisac-Urubamba in taxi cost S/.20, or with buses (they depart when full) for S/.2.5. Two types of trains arrive at the station. The first is locals only that is heavily monitored to ensure no tourists ride it. There are hefty fines if caught on the locals' train. The second is the tourist train which runs Cusco/Ollantaytambo/Aguas Calientes. If you are doing the Inca Trail, you will want to get on the train to Aguas Calientes and get off when the train stops mid-route. There are three types of tourist trains. Ordered by descending price, they are the Hiram Bingham, Vistadome, and Expedition trains. Go to Peru Rail's website for more current prices and schedule. Make room in your budget though because you will need at least $100 each to do the trip both ways. If you purchase a ticket from Cusco to Aguas Calientes, you cannot get off at Ollantaytambo for a few hours and then use the same ticket from Ollantaytambo to Aguas Calientes. If you want to spend time in Ollantaytambo, it is more cost effective to take a bus to Urubamba from Cusco and then a connecting bus to Ollantaytambo (or a direct minivan). Many guide services include a train ride from Aguas Calientes to Ollantaytambo or all the way to Cuzco as a part of the guided services. In the former situation, trekkers are expected to pay for their own bus from Ollantaytambo to Cuzco and are informed of this in advance. Taking the bus from Ollantaytambo to Cuzco as opposed to the trains full route saves a half hour to an hour. Inquire with your tour operator in advance as to which tickets they purchase. Tickets purchased by the guide services to Ollantaytambo can be changed at the station the day of or the day before depending upon seat availability. Change fees can range from USD0-20 depending upon the class of train that is being changed to. Arrive at least 45 minutes early as there may be a line, for the earliest trains (05:30) the ticket office opens at 05:00. Travellers and trekkers can make excellent use of the obligatory return trip to Cuzco by staying the night in Aguas Calientes after visiting Machu Picchu and visiting the Ollantaytambo ruins, the salt mines near Maras/Urubamba, the Incan agricultural lab of Moray, or the ruins above Pisac the next day (all of which are along the route back to Cuzco in that order). Choose two sites and allow a half day for each site for relaxed viewing, transit, and meals. The last buses from Pisac to Cuzco leave around 20:00. Be aware of your belongings on buses after dark. Or, stay in Pisac and backtrack to any of the sites the next day. Inquire at Ulrike's cafe in Pisac for lodging recommendations (open until 21:00). There is no public transport network in Ollantaytambo. Walking or cycling is the best idea. Three wheeled moto-taxis and regular taxis are available at the train station but are not necessary. The walk from the train station to the main plaza is approximately a quarter mile (400m). It can be broken up by various restaurants that line the way even after the busiest sections. It is a two minute walk from the main plaza to the ruins. Some areas of Ollantaytambo are very steep and if you want to take a taxi from/to your hotel, you may be better off getting a moto-taxi to avoid having to carry all your luggage up steep steps. A number of roads are very narrow, so the only way to get access to them is via a moto-taxi. The roads are mostly of pebblestone making it very difficult to roll your suitcases along them. Moto-taxis will charge PEN5-10 to get from your hotel to the town centre. You can try using Uber to get around but more often than not, there are no Uber drivers available in Ollantaytambo. A boleto turistico is required for access to some of the sights in and around Cuzco. It can be bought at the Oficina Ejecutiva del Comité (OFEC), Av Sol 103, Cuzco, ☎ +51 84 227037. Tickets give access to the following sites in Cuzco: Santa Cataline Monastery, Museo Municipal de Arte Contemporáneo, Museo Historico Regional, Museo del Sitio del Qoricancha, Museo de Arte Popular, Centro Qosqo de Arte Nativo Danzas Folklórico and Monumento Pachacuteq. 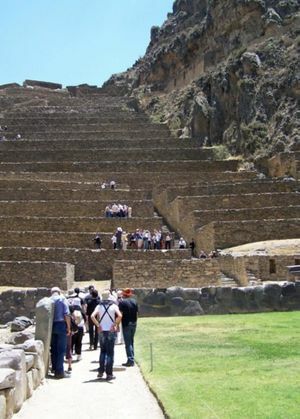 They also allow access to other sites around Cuzco: Sacsayhuamán, Qénqo, Pukapukara, Tambomachay, Chinchero and the ruins of Pisac, Ollantaytambo, Tipon and Pikillacta. Take a stroll through the town. There are still several houses dating back from Incan time. The small canals running throughout the town serves as the water supply and also dates back to Incan time. 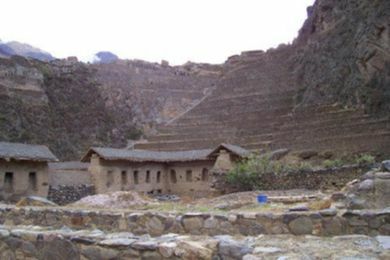 Ruins of Ollantaytambo - ruins of largely religious significance, they doubled as the the last and largest defensive structures near the plains below where the Incas defeated the Spaniards in battle. Admission with boleto turistico (can be purchased at entrance to ruins). Or you can get a partial boleto turistico for S/.70 (S/.40 for Peruvians) that gives you one day to see this site and 3 others. Local guides can be hired in the market area below the ruins (S/.20). Or, do it yourself by purchasing the book most of the guides use, ¨Cuzco and the sacred valley of the Incas¨(salazar and salazar) which has an extensive section on Ollantaytambo. The book can be purchased in the market below the ruins (S/.50) or in advance in Cuzco (S/.35). Neither the guides nor the guidebook discuss the battles, for information on this research on your own in advance. Tours focus largely on the unique architectural significance of the sun's rays on the cad face of the canyon wall and on the temple walls, the still functioning fountains, and the large stone operating table. Even if you're not an archaeology buff or ruins fan, these are worth seeing. Beautiful views abound. Pinkullyuna is the hill with Incan storehouses overlooking the town and facing the main ruins. To get to the path up to these ruins, follow the road closest to the base of the hill (the rightmost one in the town grid when facing Pinkullyuna). You will see a small sign with an arrow pointing to a steep path, which takes you up to a series of ruins and storehouses. Admission is free, and from here you can see some of the most spectacular views of the Ollantaytambo ruins and town and the Urubamba Valley. It's a lovely hike, and can be done in just an hour or two. Some parts of the various path can be a little harrowing, especially the less oft used side paths (all of these also lead to ruins that are less apparent). Go with a friend or at least make sure you let your hosts at the hostel know where you have gone in case something should happen. The ruins are open from 7am until 4:30pm. Look for houses with red plastic bags hanging outside on posts. These houses are where locals go to drink chicha, a local brew made out of corn. It is a great way to experience the local flavor, provided that you speak enough Spanish to communicate with the other chicha drinkers. It is advisable that you look for a place that serves things other than chicha, as some people find the taste unpleasant. However this is an acquired taste and can be overcome easily. Chicha, unlike masato made in the rainforest is not made by mixing with saliva as erroneously stated in the entry that this is correcting. Careful with the chicha, however - it is sometimes made under unhygienic conditions and it could make you quite sick. Visit the Old Town unique in all of Peru, this part of Ollantaytambo was built by the Incas over five hundred years ago is inhabited to date. Entering an Inca cancha or courtyard is like travelling back in time. KB Tambo, a hostel, restaurant, mountain bike, and adventure tour office rents mountain bikes by the day and arranges tours. If you're lucky, KB himself will lead the tour; if you get this opportunity you should jump on it, and be advised you're likely in for some serious adventure. Chicha Tours http://www.chichatours.com/, the best way to experience Chicha (described above). Led by two quirky expats, they'll take you to the best and safest chicherias in the Sacred Valley while teaching you about the history and production process of this unique beverage. A fun and informative way to experience the local culture first hand. Hike. There's plenty of hiking to be done in this area, and hardly any people doing it. Ask around. A beautiful hike is to Pumamarca, around 6 or 7 km northeast of Ollanta, near the township of Pallata. Either just follow the main road which hardly sees any traffic and after around 5 km take the left turnoff for the site. There is a sign there, can't go wrong. Another option is an old trail higher up in the mountains. Ask directions or use OpenStreetMap. Usually you'll be the only one there, and there is a lot of buildings still in good condition. There are several shops, mainly Inca souvenir types. A market plaza for tourists sits at the entrance to the ruins, small shops up the hill from the plaza may carry the same items and be more willing to negotiate. On the way from the ruins to the plaza, look out for the Awamaki Fair Trade Store after the bridge on your right hand side. Emphasis is on fairly-traded weavings from the Patacancha valley made with 100% natural fibers and dyes, as well as a select range of books, alpaca yarn and other locally produced artisan items. The project is non-profit and proceeds from the store are invested into community development projects in the Patacancha Valley. El Albergue Restaurant within the El Albergue B&B this new restaurant has a first rate open kitchen where you can see your alpaca and trout dinners being prepared. Menu options include homemade fettuccine, sandwiches and great breakfast. In the evening white table cloths are spread, candles are lit, and the restaurant becomes a first rate dining experience. Cafe Mayu is on the Ollantaytambo train station where you can grab a very good espresso or cappuccino as well as chocolate chip cookies and brownies. You can browse their menu for great breakfast and lunch options. Sunshine Cafe Located very close to the entrance to the Ollantaytambo ruins, this restaurant is owned by a young American woman from North Carolina and is an excellent location for a breakfast including toasted wraps, American / European style breakfast, and fruit bowls with a variety of different drinks. The English Pub: Ollanta's first "pub" opened in early 2010. Landlord Porfirio has years of experience bar-tending and knows what a real bar needs. The only place in town with British ales on tap, comfy sofas and satellite TV. Local non-profit Awamaki hosts regular quiz nights, salsa nights and everything-else nights in between. Hang out at El Ganso with very down-to-earth owner "Acha". Full Moon Lodge, Pilcohuasi. Located near the centre of town, with a nice view of the countryside. Simple, clean rooms with private bathrooms and hot showers. Specializes in mystic tours. USD15-20 per night. Hostal Kiswar is right on the main plaza. A nice, clean hostal with private rooms and private bathrooms with hot showers. The owner, Jesús, also owns the adjoining Café (Café Kiswar) and will be happy to talk to you about Ollantaytambo culture, tours, or how good his coffee is. USD17-33 per room. Hotel Munay T'ika, just up the road from the railway station, not too far from Pakaritampu. Inexpensive but clean hostal that also provides breakfast of breads, jams, eggs, banana pancakes, coffee and tea in the mornings. c. USD30. There is also camping to be found in town, probably more suitable for really tight budgets. Ask around and follow signs. Hostal Chaskawasi Near the main plaza, this hostel is managed by Katy, nice girl, very friendly and helpful. A pleasure to stay there. The place is clean, there are different spaces created for different ambience: bar, TV, room with sofas, maps and a lot of advice about things to do. If you ask Katy, she can lend you Lonely Planet "Central America on a Shoestring" or "South America on a Shoestring". Beds in a 4-bed-dorm from USD20, or private rooms. Hostal El Tambo, Calle del Horno in Incan Town. Located in the middle of the old Incan pueblo, with clean rooms and a beautiful garden. Operated by a very friendly Peruvian family. Rates are USD10/person, rooms are private with shared bathrooms. Hostal Las Orquideas, Ave Ferrocarril. ☎ +51 84 204032 Small rooms around courtyard with shared bath. Often used by tour groups. Upper floor has view of ruins. Rates vary from USD20-50, but for USD25 a night you can have a private bathroom, and the room has two beds for you to use. Excellent quality, and just down the road from the train station. KB Tambo, located at the top of Ave Ferrocarril, the road from the railway station, at the intersection of the main road through town (Calle Ventidero) ☎ +51 84 204091 Recently newly reconstructed with private baths in every room, pleasant courtyard garden and awesome rooftop deck with ruins views. English speaking owner - "KB" (very dynamic and interesting guy) - also rents mountain bikes by the day or will arrange a tour. USD10-28 per person. El Albergue Ollantaytambo, Ollantaytambo Train Station platform, Fax: +51 84 204014. Built in the 1920's this hotel was reopened in the 70s as a backpacker place and has been renovated recently to include private baths, hot showers, beautiful gardens and friendly staff. The Albergue restaurant is rated one of the best in the Sacred Valley serving delicious trout, and alpaca, as well as homemade fettucine and great breakfast. Cafe Mayu, outside serves some of the best coffee in all of Peru. The proprietor, Wendy Weeks, has been living in Peru for 30 years. Affordable prices, excellent food, English spoken. Don’t forget to take the sauna included in price of room. Knowledgeable staff offers great orientation and arrangements for day hikes, tours and activities. Hammocks in the back a great addition if you choose to just hang out. Rates USD58-74.During peak season (1 May–31 Aug) minimum stay two nights required, discounted Dec-Mar. Hostal Sauce, Calle Ventiderio 248, ☎ +51 84 204044, Fax: +51 84 204048, Located at the top of the road to the train station and Calle Ventiderio (the main road through town) and just off the main square, some rooms have views of the Ollantaytambo ruins, breakfast included, no restaurant. USD88-145. Tunupa Lodge, Ave Ferrocarril, 200m from train station to Machu Picchu. Located just above Pakaritampu, this hotel has an incredible panoramic view of the surrounding area, which includes the glacier-topped Mt. Veronica, the Incan fortress of Ollantaytambo, the Incan ruins of Pinkuylluna, and the Andes Mountains. The hotel is located on a 5,000m² yard complete with picnic tables and garden terraces for enjoyment of the surroundings. The rooms itself are classy, clean, and include private bathrooms, hot showers, and free internet. Breakfast is included as well with any stay. Rates USD50-70. Hotel Pakaritampu, about halfway down Ave Ferrocarril between the main square and the railway station. ☎ +51 84 204020 Recently constructed modern rooms. Beautiful garden. Restaurant and bar. Business Centre. USD127-276. If you get the train from Aguas Calientes to Ollantaytambo, there will be a bunch of combis waiting for you outside the train station that go to Cusco Plaza de Armas. Some are PEN10 and some are PEN5 more. At the train station, you will also find a number of taxis waiting to go back to Cusco. These will often take you for a very low amount (PEN50-70) as drivers will try to avoid returning empty-handed. This page was last edited on 10 March 2019, at 10:05.